Okay, I know I’m posting two pork recipes back to back. I didn’t plan well. I’ve been busy organizing my kitchen. Now that my work includes my kitchen, it’s about time I get it together. While I always pride myself in using the freshest ingredients, some ingredients for cooking are better left in the pantry. Actually, I did a post on my favorite pantry/fridge ingredients for making quick spiralized meals. You can check that out here. Ingredients better left for the pantry are tomatoes in the winter and of course, pumpkin puree every day of the year. I actually made my own pumpkin puree a few times and sure, it’s not that hard, but it’s extremely time consuming. To be honest, I’d rather spend an hour flipping through my favorite blogs on Bloglovin (follow me if you aren’t already!) or spend an extra 30 minutes walking outside after work. So, as I was organizing my kitchen (before and after pictures to come!) I stumbled upon three cans of pumpkin puree. THREE!! Do you know what this means? It means that I went to the grocery store multiple times asking myself, “Do I have pumpkin if I decide to make a pumpkin recipe this week?” “Well, I’ll buy it just to be sure.” Hence, three cans of pumpkin puree. Organizing my pantry was extremely liberating. I couldn’t have done it without OXO’s POP containers. Every time I go into my pantry in the morning to get a scoop of my protein powder (now in a 4 quart POP container), I look forward to sealing it and placing it back neatly on the shelf. It is so neat, on account of the fact that these containers’ square and rectangular shapes make everything more space efficient. 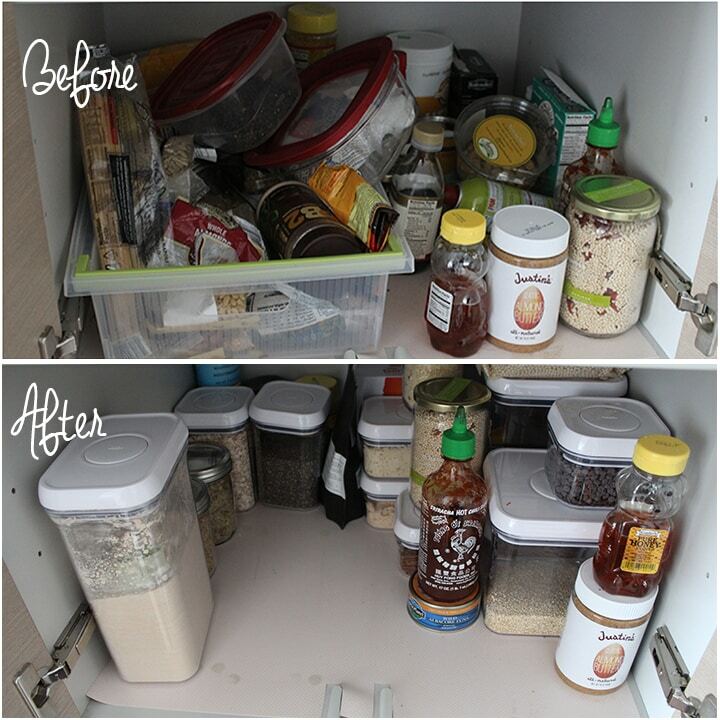 As you’ll see in the before and after pictures, my pantry seemed to double in size after I placed everything into the OXO POP containers. Not to mention, you only need a finger to open these bad boys – they really… well… pop open! While organizing, I found some expired foods, some new items I forgot I had recently purchased and just a lot of mess. I found three bottles of nutritional yeast flakes. Again, THREE! What I’m saying is, organize your pantry and you’ll save yourself money, time and you’ll better understand what’s in your home so when you go to cook, you’re well equipped. Let’s be honest, there’s nothing worse than getting halfway through a recipe and realizing you don’t have any black beans, when you thought you had just bought a can. Devastating. Before I get to my before and after, let’s talk recipe. This dish is called a “risotto” because of it’s creamy, ricey consistency (but you all know better than that – it’s made of sweet potato!) The goat cheese is just sensational here – the luxurious smoothness of this fisotto (fake + risotto!) creates an indulgent taste without the heavy nutritional counts. 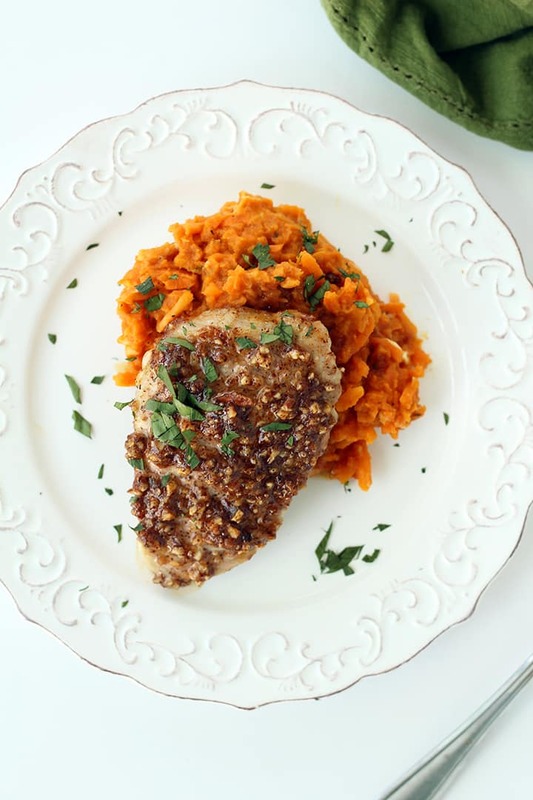 The maple-pecan crusted pork brings out the flavors in the pumpkin, sweet potato and highlights the thyme. The kicker with the pork is the pecan crust. The pecans not only add extra unprocessed, whole, clean flavor – but a wonderful crunchy texture. I would call this a date night dish. You’re trying to make something tasty for your man or woman and want to impress them but still leave room for dessert, make this. 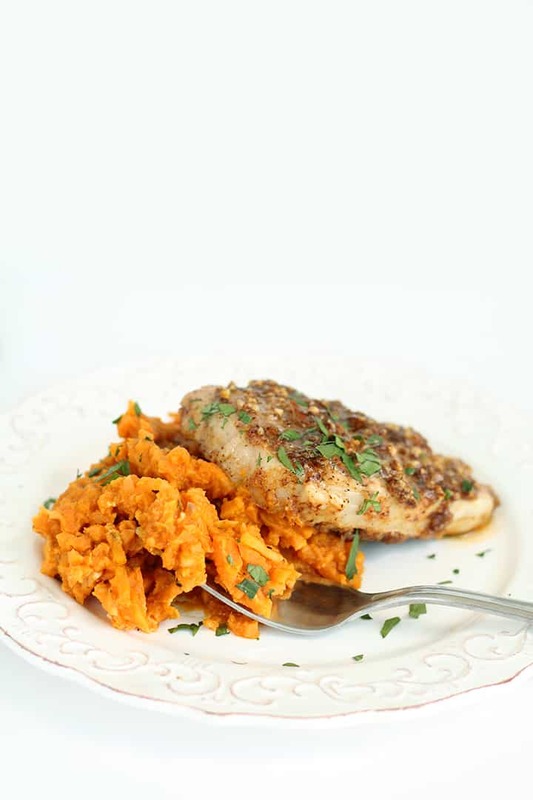 The flavors are fall-inspired and every bite you take, you will catch your significant other hurriedly going for another forkful – it’s addictive! 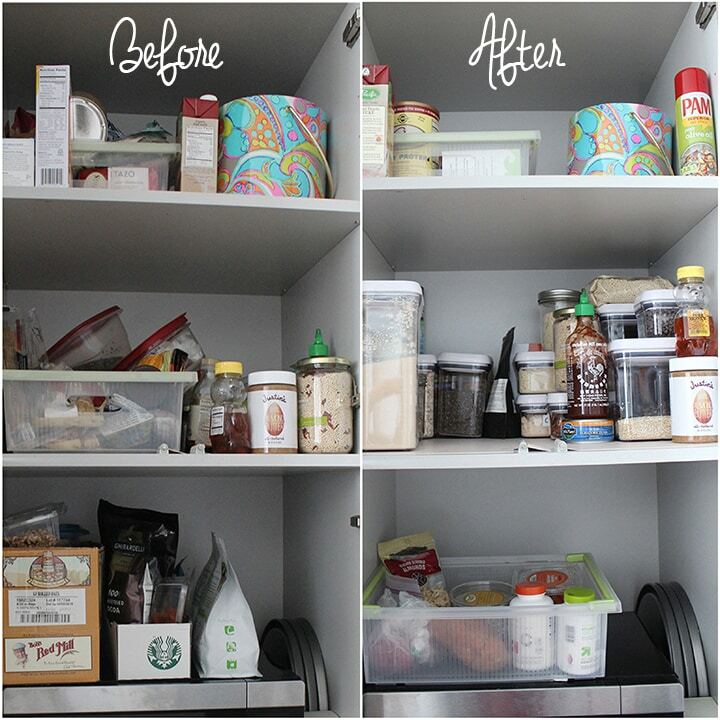 Now, pantry organizing. Please, don’t judge me. Also, my canned items are separate from this pantry – that’s for another day. Perhaps I’ll become motivated later this fall? Follow Inspiralized’s board POPtober Wishlist on Pinterest. OXO is hosting a contest to win a prize pack worth $500, including your choice of OXO Storage & Organization tools (up to $250), as well as a $250 elfa gift card, starting October 13th and running until October 31st. Mark your calendars to enter! Note: Although OXO provided the POP container set for this post, all opinions are my own. What are your best organizational tips for a pantry? 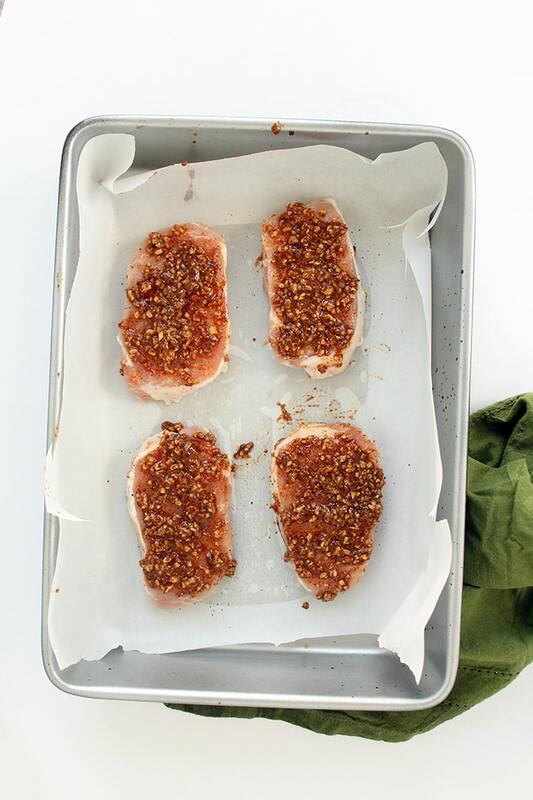 Pat your pork chops dry and season with salt and pepper and place on a parchment-paper lined baking sheet. Place maple syrup, chili powder, mustard and pecans in a small bowl and whisk together until combined. Using a brunch, spread the maple mixture over both sides of the pork chops. Bake for 16-18 minutes or until cooked all the way through. Reserve pan juices. 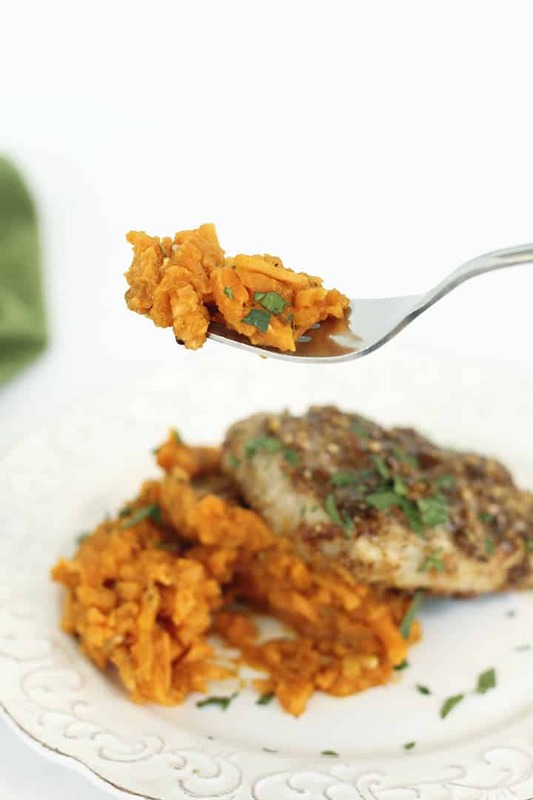 While the pork chops are baking, peel and spiralize the sweet potatoes, using Blade C. Place the noodles into a food processor and pulse until rice-like. Mince the garlic cloves and shallot and set aside. Place a large skillet over medium heat and add in the oil. Once oil is heated, add in the garlic, red pepper flakes and shallots. Cook for 1 minutes or until shallots are translucent. Add in the sweet potato rice and season with salt and pepper. Cook, stirring often, for 2-3 minutes or until rice heats through and begins to soften. Add in the pumpkin, thyme and broth and cook for 5 minutes or until sweet potato rice softens. Remove from heat, add in goat cheese and mix until goat cheese is evenly combined. 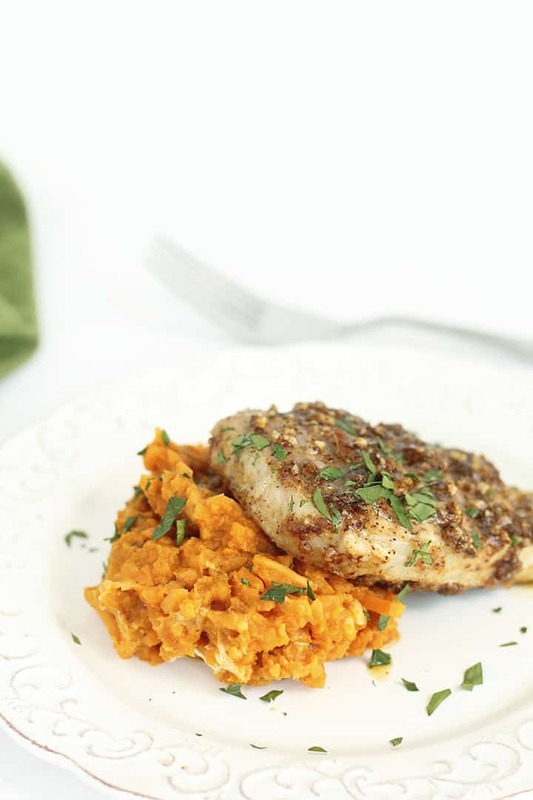 Portion the sweet potato risotto into bowls and top each with a pork chop and a drizzle of pan juices. Garnish with parsley. This sounds so amazing! And I love organizing. I'd probably put it down as my favorite hobby (no joke!). If I could do that as my job, it would be a perfect fit! Who am I to judge? ;-) Looks pretty yummy, and I wouldn't care if you were cooking for me and served pork two days in a row. Looks amazing but 29 grams of fat - yikes! I heard of your site from Skinnytaste. i haven't had a chance to look through past recipes - excited to see if there are some I can use! Pork and the goat cheese will do it for ya! Thank you so much! Oh my. . . can't wait to try this!! Looks so good for a rainy Fall night! Would I be able to leave out the goat cheese? On my Paleo I don't eat cheese. I love your site & your delicious recipes. Made this last night, and you are right. 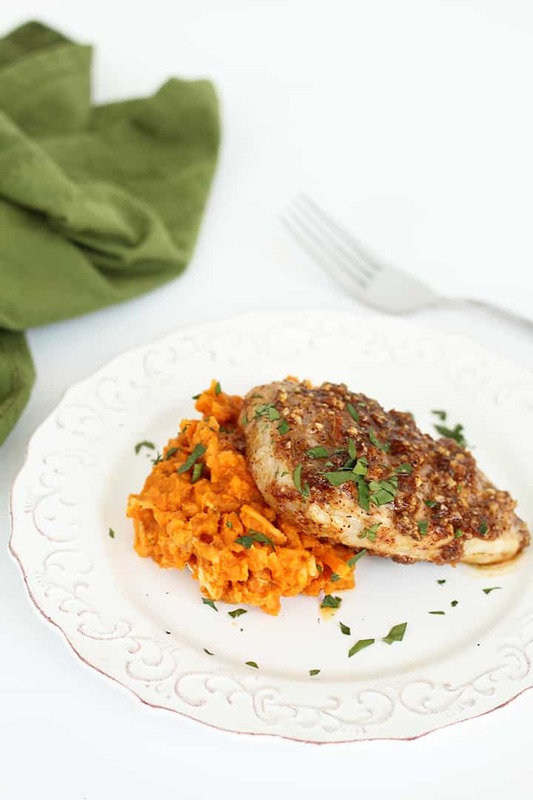 The maple, pecans, pumpkin and sweet potato go so well together! It is perfect for this time of the year. My family enjoyed your recipe. Thank you! I just made this, and it's heaven. Squash risotto might be my new favorite thing ever. Thank you! I made this last night and it was delicious!!! Thanks for coming up with such inventive combinations! This looks amazing, I can't wait to try it! Think I could substitute the pork for fish or tofu or something not meat?